It’s not particularly exciting, really, it’s a rather dull thing to write about, nevertheless, here goes. 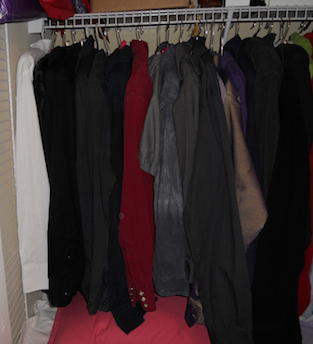 We organized my closet today, bagged a bunch of shirts for Goodwill, hung the rest nice and pretty. Lauren (my assistant) is a spectacular organizer, which I like, I like things pretty. I love throwing “stuff” away, I’ll never end up on Hoarders, I don’t keep socks from when I was seven because that’s the day Elmo, my gold fish died, and so I don’t want to forget him. “Stuff,” I enjoy tossing, it’s freeing. So, I keep the words, everything else can burn for all I care.